Posted on June 30, 2016 | Comments Off on Does shoe midsole temperature affect patellofemoral and Achilles tendon kinetics during running? The aim of the current investigation was to examine the effects cooled footwear on patellofemoral and Achilles tendon kinetics during running. Ten participants completed running trials at 4.0 m/s in two identical footwear one of which was cooled for 30 min. Lower extremity kinematics were obtained using an eight camera motion capture system and force data was obtained using a force platform. Differences between cooled and normal footwear temperatures were examined using paired samples t-tests. The results showed that peak Achilles tendon load was significantly larger in the cooled footwear (5.86 ± 1.06 B.W) in comparison to non-cooled (4.89 ± 1.04 B.W). In addition Achilles tendon loading rate was also significantly larger in the cooled footwear (48.95 ± 10.17 B.W/s) in comparison to non-cooled (42.49 ± 10.40 B.W/s). This study indicates that running in cooled footwear may place runners at increased risk from the biomechanical parameters linked to the aetiology of Achilles tendinopathy. 2 – School of Psychology, University of Central Lancashire. 3 – School of Health Sciences, University of Salford. Runners are known to be extremely susceptible to chronic lower extremity pathologies; 19.4-79.3 % of all runners’ will suffer from a chronic pathology over the course of one year . The knee and ankle joint are the most commonly injures musculoskeletal structures and are associated with up to one-fifth of all running injuries . The running shoe represents the main interface between the runners and the surface during running , and has thus been strongly advocated as a mechanism by which the injury rate can be mediated. One of the most important aspects of the running shoe is the mechanical dampening properties of the midsole . The majority of running shoes utilize a copolymer called Ethylene-vinyl acetate as it is both durable and flexible even at low densities . Ethylene-vinyl acetate like most polymers exhibits viscoelastic properties , and thus its mechanical properties are temperature dependant . The effects of different midsole temperatures have been examined previously. Kinoshita & Bates  investigated the influence of different environmental temperatures on the shock absorbing characteristics of running shoe midsoles using mechanical testing. Their findings showed that with increasing temperature, peak acceleration and energy absorption decreased, and the total peak deformation of the midsole increased. Sinclair et al.,  examined the effects of cooled footwear on the kinetics and kinematics of running in comparison to identical footwear maintained at room temperature. Their findings showed that the cooled footwear were associated with significantly increased vertical loading rate and also peak angle of eversion/ tibial internal rotation. There has yet to be any published information concerning the effects of footwear midsole temperature on the loads experienced by the frequently injured knee and ankle joints. Therefore the aim of the current investigation was to examine the effects cooled footwear on patellofemoral and Achilles tendon kinetics during running in comparison to footwear at normal temperature. Ten female runners took part in this study. All were injury free and provided written informed consent. The mean characteristics of the participants were: Age = 21.55 ± 2.58 years, Height = 1.67 ± 0.07 m, Mass = 61.29 ± 5.01 kg. The procedure utilized for this investigation was approved by the University of Central Lancashire, ethical committee. Two identical trainers (Nike Free run 5.0+; sizes 4-7 UK) were used one of which was artificially chilled (cooled) and one was maintained at room temperature (normal). The temperature of the experimental footwear was reduced by placing them inside a freezer which maintained a constant temperature of -25°C for 30 mins . Kinematic data were obtained via an camera optoelectric motion capture system (Qualisys Medical AB, Goteburg, Sweden) using a capture frequency of 250 Hz. Participants completed five trials running at 4.0 m/s in both cooled and normal footwear conditions. A maximum deviation of 5 % from the predetermined velocity was allowed. The participants struck a force platform (Kistler Instruments, Model 9281CA) sampling at 1000Hz with their right (dominant) foot. Locomotion velocity was measured using timing gates (SmartSpeed Ltd UK). 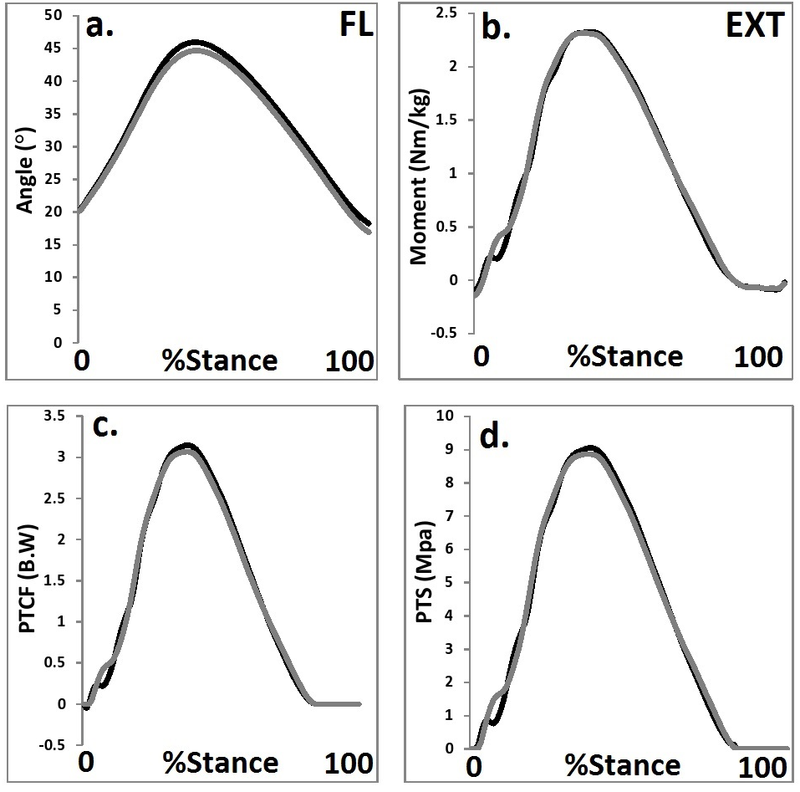 The stance phase of running was defined as the duration over which > 20 N vertical force was applied to the force platform . To model the thigh, shank and foot segments calibrated anatomical systems technique was utilized . To define the segment coordinate axes of the right; foot, shank and thigh, retroreflective markers were placed unilaterally onto 1st metatarsal, 5th metatarsal, calcaneus, medial and lateral malleoli, medial and lateral epicondyles of the femur. The centres of the ankle and knee joints were delineated as the midpoint between the malleoli and femoral epicondyle markers. The hip joint centre was taken as a point one-quarter of the distance from the ipsilateral to the contralateral greater trochanter . The centres of the knee and ankle joints were taken as the midpoint between the malleoli and femoral epicondyle markers [11, 12]. Carbon fibre tracking clusters were utilized to track the shank and thigh segments, whereas the foot was tracked using the 1st metatarsal, 5th metatarsal and calcaneus markers. Static calibration trials were obtained allowing for the anatomical markers to be referenced in relation to the tracking markers/ clusters. Ground reaction force and kinematic data were filtered at 50 and 15 Hz respectively using a low-pass Butterworth 4th order filter using Visual 3-D (C-Motion, Rockville, MD, USA). Kinematic measures from the knee and ankle joints which were extracted for statistical analysis were 1) angle at footstrike, 2) peak angle and 3) relative range of motion (representing the angular displacement from footstrike to peak angle. Joint moments were calculated using Newton-Euler inverse-dynamics, which allowed net knee and ankle joint moments (Nm) to be calculated. The net joint moments were normalized by dividing by body mass (Nm/kg). Patellofemoral kinetics were examined through extraction of peak knee extensor moment (KEM), patellofemoral contact force (PTCF) and patellofemoral contact pressure (PTS). PTCF was normalized by dividing the net PTCF by body weight (B.W). PTCF during running was estimated using knee flexion angle (kfa) and KEM through the biomechanical model of Ho et al., . This model has been utilized previously to resolve differences in PTCF and PTS in different footwear [14-16]. PTS (MPa) was calculated using the net PTCF divided by the patellofemoral contact area. The contact area was described using the Ho et al.,  recommendations by fitting a 2nd order polynomial curve to the data of Powers et al.,  showing patellofemoral contact areas at varying levels of kfa. Descriptive statistics (means and standard deviations) were obtained for each footwear temperature. Differences in patellofemoral and Achilles tendon load parameters between cooled and normal footwear conditions were examined using paired samples t-tests, with statistical significance was accepted at the P≤0.05 level . In addition minimum clinically important differences (MCID) were calculated as being 2.3 * the pooled standard error. All statistical tests were conducted using SPSS v22.0 (SPSS Inc, Chicago, USA). Table 1 and figures 1-2 present the patellofemoral and Achilles tendon parameters observed as a function of footwear temperature. Figure 1 Knee joint kinetics and kinematics as a function of cooled footwear (a. = knee sagittal angle, b. = knee sagittal moment, c. = PTCF, d. = PTS) (black = cooled and grey = non-cooled). Table 1 Patellofemoral and Achilles tendon load parameters as a function of footwear temperature. Figure 2 Ankle joint kinetics and kinematics as a function of cooled footwear (a. = ankle sagittal angle, b. = ankle sagittal moment, c. = ATF) (black = cooled and grey = non-cooled). No significant (P>0.05) differences in knee joint kinematics were observed. The ankle joint was shown to be significantly (t (11) = 3.62, P<0.05) more dorsiflexed at footstrike in the non-cooled footwear. In addition peak dorsiflexion was significantly (t (11) = 3.77, P<0.05) larger in the non-cooled footwear. No significant (P>0.05) differences in patellofemoral loads were shown (Table 1; Figure 1). Peak plantarflexion moment was significantly larger (t (11) = 3.25, P<0.05) in the cooled footwear (Table 1; Figure 2b). In addition Achilles tendon load was significantly (t (11) = 3.56, P<0.05) greater in the cooled footwear (Table 1; Figure 2c). Finally the results also confirm that Achilles tendon load rate was significantly larger (t (11) = 2.99, P<0.05) in the cooled footwear (Table 1). The first key observation from the current work is that patellofemoral loads were not significantly influenced by alterations in shoe midsole temperature. Patellofemoral pain syndrome is the most common chronic pathology associated with running and is considered to be caused by excessive patellofemoral loading . Therefore importantly it appears based on the findings from the current work that footwear temperature does not appear to affect runner’s susceptibility to patellofemoral disorders. However the findings from this investigation did show that Achilles tendon load parameters were shown to be significantly larger in the cooled footwear condition in comparison to the footwear maintained at normal temperature. This observation is in agreement with those of Kulmala et al.,  and Sinclair,  who demonstrated that different midsole characteristics can influence the loads experienced by the Achilles tendon. The increases in Achilles tendon loads may have specific clinical relevance regarding the aetiology of Achilles tendon injuries as the differences exceed the magnitude denoted by the MCID. When loads of high magnitudes are applied to the tendon too frequently in sports such as running, this can lead ultimately to degradation of the tendon itself . Based on these observations it appears that running in cooled footwear places runners at increased risk from Achilles tendinopathy. It is proposed that this finding is due to the reduced midsole temperature of the cooled footwear. Sinclair et al.,  found that cooled footwear midsoles offer reduced deformation and shock attenuating properties when compared to those at room temperature. 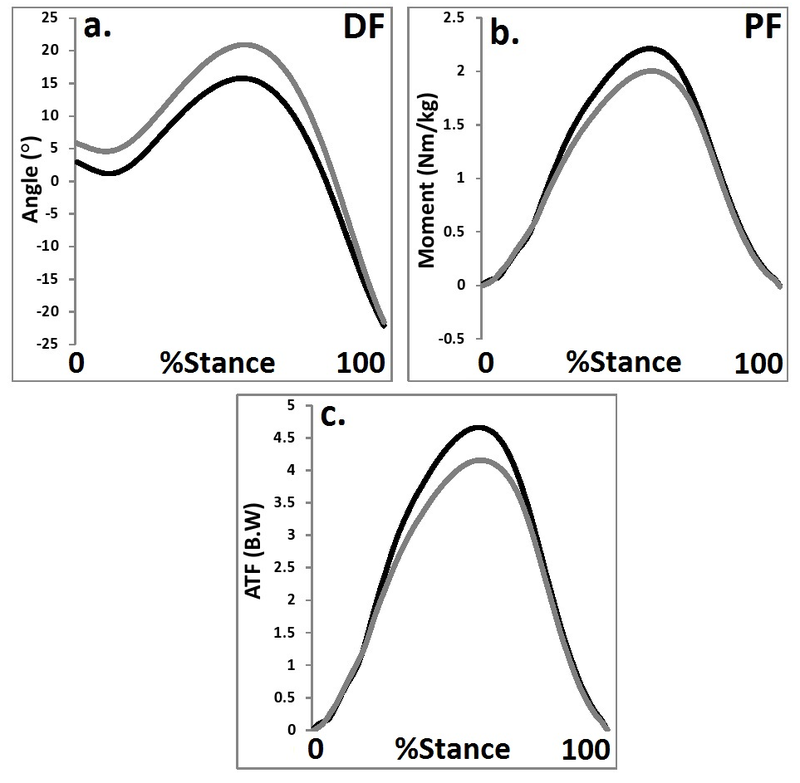 The kinematic observations showed that the ankle position was significantly more plantarflexed in the cooled footwear throughout the stance phase when compared to the non-cooled condition. This observation has been shown previously as an adjustment that most runners make in response to a increases in footwear or surface stiffness. Increases in ankle plantarflexion are associated with a shortening of the Achilles tendon moment arm, which leads to an increase in the load borne by the tendon itself . A potential limitation of this study is that knee and ankle joint loading was estimated using a musculoskeletal modelling approach. This approach was necessary as direct measures of internal forces require invasive techniques. Nonetheless, the use of net extensor and plantarflexor moments as inputs into the calculation of patellofemoral and Achilles tendon kinetics means that antagonist forces acting in the opposing direction of the joint itself are not accounted for which may ultimately lead to an underestimation of joint loading. In conclusion, whilst previous investigations have considered the effects of shoe midsole temperature on biomechanical parameters the effect of changing the temperature of the midsole on knee and ankle loading has not been considered. The current investigation addresses this by providing a comparison of patellofemoral and Achilles tendon kinetics when running in cooled and normal temperature footwear. Importantly the current study shows that Achilles tendon loading parameters were significantly greater when running in cooled footwear. First and foremost this study provides further insight into the biomechanical effects of reducing footwear temperature. Furthermore, the current work indicates that running in cooler footwear places runners at greater risk from chronic Achilles tendon pathologies. van Gent, B.R., Siem, D.D., van Middelkoop, M., van Os, T.A., Bierma-Zeinstra, S.S., & Koes, B.B. Incidence and determinants of lower extremity running injuries in long distance runners: a systematic review. B J of Sport Med 2007 41; 469-480. Shorten, M.A. (2000). Running shoe design: protection and performance pp 159-169 in Marathon Medicine (Ed. D. Tunstall Pedoe) London, Royal Society of Medicine. Brückner, K., Odenwald, S., Schwanitz, S., Heidenfelder, J., & Milani, T. Polyurethane-foam midsoles in running shoes-impact energy and damping. Proc Eng 2010 2; 2789-2793. Knauss, W.G., Emri, I., & Lu, H. (2008). Mechanics of polymers: viscoelasticity (pp. 49-96). Springer US. Dib, M.Y., Smith, J., Bernhardt, K.A., Kaufman, K.R., & Miles, K.A. Effect of environmental temperature on shock absorption properties of running shoes. Clin J of Sport Med 2005 15; 172-176. Kinoshita, H., & Bates, BT. The effect of environmental temperature on the properties of running shoes. J App Biomech 1996 12; 25-268. Sinclair, J., Naemi, R, Chockalingam, N., Taylor, P.J., & Shore, H.F. The effects of shoe temperature on the kinetics and kinematics of running, Footwear Sci 2015 7; 173-180. Sinclair, J., Edmundson, C.J., Brooks, D., & Hobbs, S.J. Evaluation of kinematic methods of identifying gait events during running. Int J Sports Sci & Eng 2011 5; 188–192. Cappozzo, A., Catani, F., Leardini, A., Benedeti, M.G., & Della, C.U. Position and orientation in space of bones during movement: Anatomical frame definition and determination. Clin Biomech 1995 10; 171-178. Sinclair, J., Taylor, P.J., Currigan, G., & Hobbs, S.J. The test-retest reliability of three different hip joint centre location techniques. Mov Sport Sci 2014; 83, 31-39. Sinclair, J., Hebron, J., & Taylor, P.J. The Test-retest Reliability of Knee Joint Center Location Techniques. J App Biomech 2015 31; 117-121. Graydon, R., Fewtrell, D., Atkins, S., & Sinclair, J. The test-retest reliability of different ankle joint center location techniques. The Foot and Ankle Online journal, 8, 1-11. Ho, K.Y., Blanchette, M.G., & Powers, C.M. The influence of heel height on patellofemoral joint kinetics during walking. Gait Posture 2012 36; 271-275. Bonacci, J., Vicenzino, B., Spratford, W., & Collins, P. (2013). Take your shoes off to reduce patellofemoral joint stress during running. Br J Sports Med. Epub ahead of print: doi:10.1136/bjsports-2013-092160. Kulmala, J.P., Avela, J., Pasanen, K., & Parkkari, J. Forefoot strikers exhibit lower running-induced knee loading than rearfoot strikers. Med Sci Sports Exerc 2013 45; 2306-2313. Sinclair, J. Effects of barefoot and barefoot inspired footwear on knee and ankle loading during running. Clin Biomech 2014 29; 395-9.
van Eijden, T.M., Kouwenhoven, E., Verburg, J., & Weijs, W.A. A mathematical model of the patellofemoral joint. J Biomech 1986 19; 219–229. Powers, C.M., Lilley, J.C., & Lee, T.Q. The effects of axial and multiplane loading of the extensor mechanism on the patellofemoral joint. Clin Biomech 1998 13; 616–624. Self, B.P., & Paine, D. Ankle biomechanics during four landing techniques. Med Sci Sports Exerc 2001; 33, 1338–1344. Sinclair, J., Taylor, P. J., & Hobbs, S.J. Alpha level adjustments for multiple dependent variable analyses and their applicability–a review. Int J Sport Sci Eng 2013; 7, 17-20. Magnusson, S.P., Langberg, H., & Kjaer M. The pathogenesis of tendinopathy: balancing the response to loading. Nat Rev Rheumatol 2010; 6: 262–268.